The Big River Racing Team has had many excellent performances across the board as they race in the month of October. 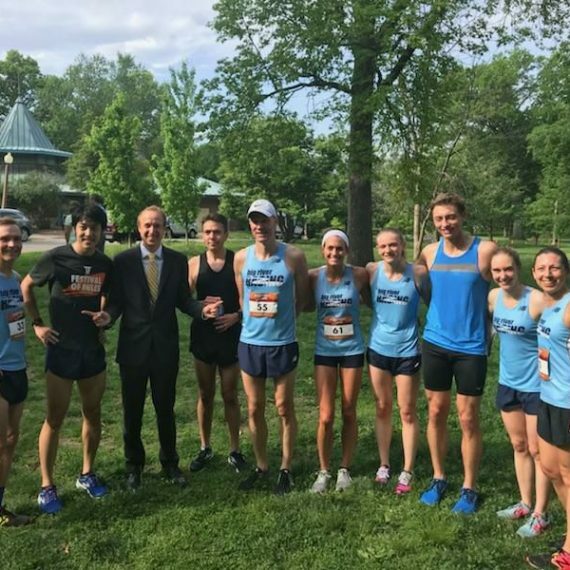 The team members raced in fairly reasonable conditions (with some exceptions) getting good times and placing well in multiple races across the St. Louis area as well as other areas in the country. The following day the team was split again to two different areas of the country. First in St. Charles, the team had multiple competitiors in the half marathon on an abnormally humid day in October. At 100% humidity and 70s temps, the team trekked along with over 2500 other runners through downtown St. Charles, to New Town and then back to downtown St. Charles. Leading the pack of runners was Julia Kohnen who won the overall race with John Kelly nabbing a 6th place finish overall 2nd in his age group and Santo Belle with a top 30 finish and 2nd in his age group. Back in Chicago for day 2 of the festivities, the team had quite a showing at the Chicago Marathon. The team raced 26.2 through the streets of Chicago passing through popular areas in the city. Leading the charge for the team was Matt Kruger who finished 55th with Matt Lawder not too far behind him in 61st. Laura Hillard leading the charge for the women taking 47th in the women’s race with Trish Frisella taking 52nd. There were also strong performances by Sarah Kruger, Michelle Dillon, Pat, and Maureen as well. Big weekend for the team. The following weekend saw some strong performances on the roads and in the fields. Starting on the roads was Flat as a Pancake which took place in Florissant, MO with the reputation of being one of the flattest road courses in the state to run on. The sole runner for the team Jon Petter competed very well nabbing a 2nd place overall finish and finishing the day with pancakes courtesy of one of the race sponsors, Chris’ Cakes. Also in Kirkwood, MO was the Hope 5K of which Marcus Walton was this year’s champion over the rest of the 100+ man field. In the fields in Elsah, IL was the Principia Cowbell XC Classic. The field saw as many as 15 teams across the Midwest in D2, D3, and NAIA divisions respectively. Scattered in this race are also unattached open which includes the sole Big River runner Riley Flynn. Racing in this rolling hill course, Riley placed within the top 25 of the 88 man field. The next week saw a lot of action of which the team took part in. Starting on Saturday in Chesterfield was the Chesterfield Chamber of Commerce Gumbo Flats Pumpkin Run of which saw about 1500 competitors and walkers which is its biggest turnout yet according to the Chamber. This run had two team members racing in the festivities of which the weather was favorable for racing. Philip Soncasie who ran the 5k race won the overall race in the men’s division while Chris Floyd split at the appropriate point to win the overall 10k race defending his title as he won last year’s race as well. Sunday was an exciting day for the team as there was a lot of good times ran in the Go Halloween Races of which Big River Running sponsors and the Columbus Marathon in Columbus, OH. First in Columbus, the team had one sole racer Andrea Bynum in race. Andrea Bynum raced through the city to take a 9th place overall finish in the women’s field and placing 3rd in her age group. Well deserved after a great race in Columbus. Turning Back to St. Louis was the Go Halloween Races. These races are among the largest themed races in the nation seeing as many as 5000+ competitors in the races. This year was quite the adjustment as the team raced through the hills, streets and allies of St. Louis in less than ideal cold conditions. Despite that, the team saw as many as 13 personal records (PRs) broken throughout the races for the team. Starting in the 5K, Matt Rosene coming back from injury was very strong in the race taking the finish ribbon for the overall 5k race. Julie Lefere took 7th in the women’s race and 2nd in her age division. Following that the team had multiple racers in the 10k. Led by Brice Pavey who raced strong took a top 5 finish placing 5th overall and 2nd in his age group with Caleb Emberton right behind him in 6th and winning his age division, Matt Mixdorf in 7th winning his age division, Jason Holroyd in 8th winning his age division, Mark Spewak in 9th placing second in his age division and Tony Wang placing 10th and placing 3rd in his age division. Six men in the top ten along with several placings in their respective age division is something that the team is very proud of especially in the hard work the team has been putting in. The successes don’t stop there as several other men placed well on the team. Marshall Phares got 14th overall and placed 7th in a very competitive age division and Anthony (Tony) Hilkin rounding out the top 15 placing 2nd in his age division. John Kelly who recently raced the Mo Cowbell Half placed 16th in the 10k and 2nd in his age division. Juan Arias also had a strong race winning his age division and placing 36th overall. David Chun placed 3rd in his age group rounding out the top 40. In the women’s races Sarah Kruger had an excellent race taking 2nd in the overall women’s field Julie Lossos-Snow took 4th in the women’s race and won her age division and Heidi Schmidt was not far behind taking 6th overall in the women’s race and in her age division. The excitement continues as the team also had racers in the half marathon as well. Marcus Walton took 4th overall with Riley Flynn right behind him in 5th both winning their respective age divisions. Congrats to the team for all the PRs and their hard work by the racers this weekend. The final week of October saw some action at multiple places in the St. Louis area. First at the Bobcat Shuffle, Julie Reitz won the race and then at the Glendale Firehouse Run, Julie Lossos-Snow won her 5th title for the race for the 8K/5 mile race, Ben Hudson winning the men’s 8k/5 mile race and Erika Holroyd winning the 2.2 mile race. This race has saw a lot of exciting races and performances by the team. Stay tune for next month’s wrapup as we will cover lots of races including local turkey trots across the St. Louis, St. Charles areas.